For carrying out section 301 and title IV of the PHS Act with respect to drug abuse, [$1,419,844,000] $1,296,379,000. 2 Reflects HEAL Initiative funding not obligated in FY 2018, and carried over into FY 2019. 1Budget Estimate to Congress includes mandatory financing. Major changes by budget mechanism and/or budget detail are briefly described below. Note that there may be overlap between budget mechanism and activity detail and these highlights will not sum to the total change for the FY 2020 President’s Budget. 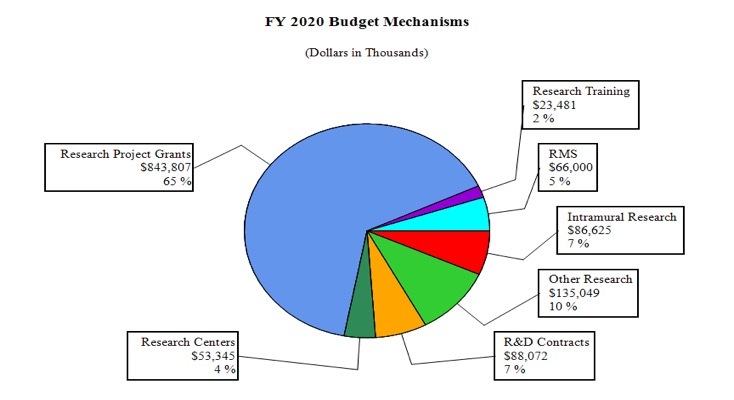 The FY 2020 President’s Budget for NIDA is $1,296.4 million, a decrease of $123.5 million from the FY 2019 Enacted level. Research Project Grants (RPGs) (-$56.0 million; total $843.8 million): NIDA will reduce funding for RPGs by 6.2 percent which is a $56.0 million decrease from the FY 2019 Enacted level. Competing RPGs are expected to decrease by 42 percent or 182 grants compared to the FY 2019 level of 437 awards. The amount of support to competing awards will be reduced by $142.5 million from FY 2019. These reductions are distributed across programmatic areas and basic, epidemiology or clinical research. Research Centers (-$5.9 million; total $53.3 million): NIDA will reduce non-competing awards by 5 percent relative to their full funding level and fund fewer new and competing awards. Other Research (-$43.2 million; total $135.0 million): NIDA will reduce non-competing awards by 5 percent relative to their full funding level and fund fewer new and competing awards. Ruth L Kirchstein Training (-$2.6 million; total $23.5 million): NIDA will fund fewer new and competing training awards, with a reduction of 48 full-time training personnel relative to FY 2019 Enacted levels. Intramural Research (-$9.6 million; total $86.6 million): NIDA will decrease the intramural research budget by 10.0 percent relative to FY 2019 Enacted levels. Research Management and Support (RMS) (-$7.0 million; total $66.0 million): NIDA will hold RMS related to opioid research flat relative to FY 2019 enacted levels while decreasing RMS funded from other sources by 10.0 percent for a total RMS reduction of 9.6 percent. The National Institute on Drug Abuse (NIDA) is the lead federal agency supporting scientific research on drug use and its consequences. Its mission is to advance science on the causes and consequences of drug use and addiction and apply that knowledge to improve individual and public health. NIDA strategically supports and conducts basic and clinical research on drug use (including nicotine), its consequences, and the underlying neurobiological, behavioral, and social mechanisms involved. NIDA also works to ensure the effective translation, implementation, and dissemination of scientific research findings to improve the prevention and treatment of substance use disorder (SUD) and to enhance public awareness of addiction as a brain disorder. NIDA’s mission is critical, given the challenges currently facing the nation. Substance use and SUD cost the U.S. more than $740 billion a year in healthcare, crime, and lost productivity1; but dollars cannot capture the devastating human cost of addiction to individuals, families, and communities. Drug overdose is now the leading cause of unintentional fatal injury in our nation. In 2017, more than 2.1 million Americans had an opioid use disorder (OUD)2, and drug overdose claimed more than 70,000 lives, about two-thirds of which were from illicit or prescription opioids. For every fatal overdose it is estimated that there are 10 non-fatal overdoses and 20 opioid-related hospitalizations3. While NIDA’s mission broadly encompasses substance use, addressing opioid misuse and addiction is a top priority at NIDA. Since drug use often co-occurs with other health conditions, including chronic pain, depression, anxiety, HIV, and hepatitis C, NIDA also supports research to characterize the complex interplay among comorbid conditions and drug use. When an individual has both SUD and another condition, understanding how the two interact can be essential for effective treatment. For example, treating a mental health condition can improve SUD treatment outcomes. In light of the opioid crisis, helping an individual effectively manage their pain with non-addictive solutions can be an essential tool for prevention and treatment. In April 2018, NIH launched the NIH Helping to End Addiction Long-term (HEAL) InitiativeSM, an aggressive, trans-agency effort to speed scientific solutions to stem the national opioid public health crisis. This Initiative will build on extensive, well-established NIH research, including basic science of the complex neurological pathways involved in pain and addiction, implementation science to develop and test treatment models, and research to integrate behavioral interventions with medications for opioid use disorder (OUD). As part of the NIH HEAL Initiative, NIDA is supporting a variety of projects aimed at advancing our understanding of how to prevent and treat opioid misuse and addiction and reverse opioid overdose. This includes research studies to (1) develop new and reformulated medications to treat OUD; (2) determine strategies to reduce opioid overdose in communities hardest hit by the opioid crisis; (3) conduct clinical trials to enhance widespread implementation of evidence-based interventions; and (4) determine ways to improve the effectiveness and adoption of interventions within justice systems. In FY 2020, NIDA will continue to expand these high-priority efforts. Developing effective interventions depends on a foundation of basic science. Understanding how drugs interact with individual genetic, neurobiological, environmental, social, and developmental factors is essential to understanding what puts a person at risk for or confers resilience to drug use and addiction. NIDA research seeks to understand the effects of drug use, addiction, and recovery on genes, molecules, cells, brain circuits, behavior, and health across the lifespan. An example is the Adolescent Brain Cognitive Development (ABCD) study, a prospective study that aims to characterize brain development in 11,874 children age 9-10 years old as they transition into adulthood. Though the recruitment was just completed, this study is already providing information on how adverse environmental factors influence the growth of the human brain, and in the future ABCD will allow researchers to assess how these brain changes subsequently influence drug-taking behaviors. NIDA also participates in the trans-NIH Brain Research through Advancing Innovative Neurotechnologies (BRAIN) Initiative, which works to accelerate the development and application of technologies that can show how individual cells and complex neural circuits interact in both time and space. The cutting-edge tools developed through the BRAIN Initiative will provide researchers with unprecedented opportunities to examine how neural systems are affected by opioids and other drugs, including how those systems change with repeated drug use and addiction. Preventing the initiation of drug use and minimizing the risks of harmful consequences associated with it are essential to addressing SUD. NIDA funds research aimed at determining the factors that underlie individual risk and resilience for addiction and common comorbidities. As such factors and the mechanisms by which they influence SUD are identified, NIDA supports work to develop and test prevention interventions targeting these mechanisms and strategies for implementing them. One example, Communities That Care (CTC), is a collaborative, multipronged prevention strategy customized to the needs of individual communities. Studies of the CTC system in 24 communities found that adolescents who participated showed significant, sustained reductions in initiation of risky behaviors, including substance use, through age 21. The success of CTC and other NIDA-supported prevention strategies underscore the importance of supporting prevention to NIDA’s broader mission, and NIDA’s current portfolio emphasizes novel strategies for preventing prescription opioid misuse and addiction. Addiction is a complex but treatable disease. Effective treatments for OUD, for example, include methadone, buprenorphine, and naltrexone. Extended-release formulations of buprenorphine, which make it easier to treat OUD patients, recently gained Food and Drug Administration (FDA) approval, including Probuphine™ in 2016 and SUBLOCADE™ in 2017. Working closely with US WorldMeds, NIDA’s medications development program partially funded the clinical trials that supported the FDA approval of LUCEMYRA™, the first medication targeted specifically to treat the physical symptoms associated with opioid withdrawal. Medications for SUD should be delivered in combination with behavioral treatments. NIDA supports research to optimize behavioral therapies, including using mobile technology. One such program, a mobile app called reSET™, is used as an adjunct to pharmacotherapy and provides users with feedback based on cognitive behavioral therapy techniques to help them stay in treatment and remain abstinent from drugs. The reSET app was approved by the FDA for non-opioid SUD, and NIDA is funding trials for an opioid-centered version called reSET-O. Under the NIH HEAL Initiative, NIDA is working to expand therapeutic options for opioid addiction and overdose prevention and reversal; optimize effective treatment strategies, including through research to understand the optimal duration of treatment; and enhance treatment for infants who are born dependent on opioids due to maternal drug use. SUD is a complex problem affected by biological factors, social structures, policies, and life histories. To effectively address SUD, it is important to understand it in the real-world contexts in which it occurs. NIDA supports implementation science research for SUD treatment and prevention in a variety of settings, including health care (e.g., primary care offices, hospitals, and emergency rooms) and justice (e.g., prisons) settings. 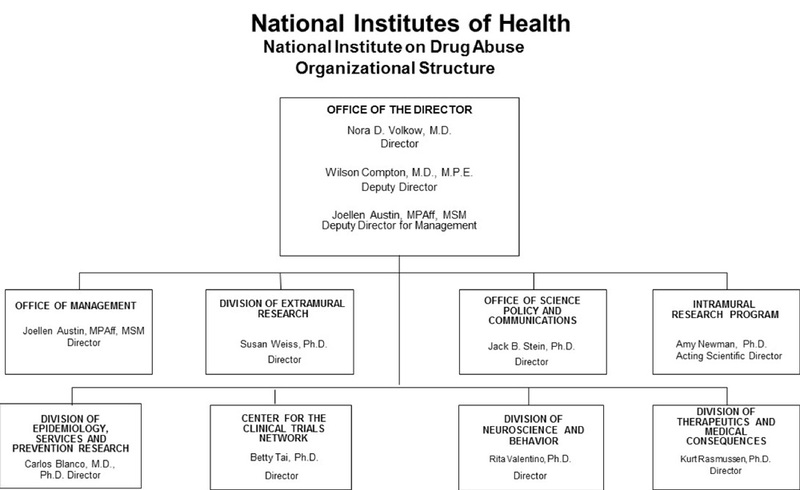 NIDA also supports research to assess the impact of federal-, state-, and systems-level policies related to drug use and SUD on public health and well-being, as well as to increase strategic partnerships within communities to improve the translation of research into policy and practice. By examining the best ways to disseminate key evidence and the most effective ways to implement evidence-based treatment and prevention, NIDA works to ensure that the results of its research can be used to maximum effect. The FY 2020 President’s Budget request for NIDA is $1,296.4 million, a decrease of $123.5 million, or 8.7 percent, compared with the FY 2019 Enacted level. Research priorities include those that position the Institute to advance basic science, develop medications, and translate the results of evidence-based findings to improve addiction prevention and treatment, with a particular emphasis on projects that have the potential to address opioid misuse and addiction. HIV prevention and treatment are also top NIDA research priorities, including research on the interactions between HIV, substance use disorder, and other comorbid psychiatric disorders; linking vulnerable populations to HIV prevention, testing, and treatment services; addressing HIV/AIDS-related health disparities; and integrating the treatment of substance use disorder and HIV. Funds are included in RPGs to support the NIH HEAL Initiative as well as the NIH BRAIN Initiative. Basic and Clinical Neuroscience: NIDA’s Division of Neuroscience and Behavior portfolio seeks to advance knowledge of the fundamental molecular, cellular, genetic/epigenetic, neurological, and behavioral processes that underlie SUD and co-occurring conditions such as HIV. Central to these goals are efforts to delineate the multiple biological and environmental factors that contribute to drug use, physical dependence, and addiction risk, with particular emphasis on determining the bases for individual differences in vulnerability and drug sensitivity. Notable projects include studies to identify genetic variants and epigenetic modifications that influence vulnerability to addiction, the effects of drugs on gene expression and brain development and function; if and how drugs alter the genome of offspring; how an individual’s genes interact with environmental conditions, such as stress and early exposure to drugs to influence risk for addiction; basic processes underlying resilience against SUD in childhood and adolescence; and gender-related differences in these effects. NIDA also supports basic and clinical neuroscience research to advance the development of compounds for treating substance misuse and SUD, to prevent the lethal side effects of drugs such as respiratory depression, and to find new non-addictive treatments for pain. This includes studies to develop analgesics for pregnant mothers that do not cross the blood-brain barrier or affect the fetus and studies to identify molecules and mechanisms that can relieve pain without producing adverse effects, including tolerance, dependence, and addiction. NIDA’s portfolio also includes research on transcranial magnetic stimulation, transcranial direct current stimulation, deep brain stimulation, and neurofeedback as potential interventions for treating SUD. NIDA supports research to develop advanced technologies that improve our ability to study the organization of the living brain—from cells to networks—and elucidate the interactions of complex neural circuits and how they encode reward, craving, compulsive behavior, and the related decision making that drive substance use. Finally, NIDA is working to support novel big data science approaches for analyzing large, diverse data sets on a scale not previously possible. Collectively, this research will provide new perspectives on the effects of drugs on multiple biological systems and improve our understanding of the basic neural and genetic mechanisms that underlie drug use, thus guiding the development of novel therapies for treating addiction. NIDA’s portfolio also includes basic research to understand trajectories of substance use and its effects across the lifespan, funded by the Division of Extramural Research. Under the Collaborative Research on Addiction at the NIH (CRAN) initiative, NIDA, the National Institute on Alcohol Abuse and Alcoholism, and the National Cancer Institute, along with other components of the NIH and the Centers for Disease Control and Prevention (CDC), are supporting a longitudinal study to examine how substance use affects neural development and identify factors that make adolescents vulnerable to SUD. The Adolescent Brain Cognitive Development (ABCD) study will follow the development of more than 10,000 children over 10 years beginning at ages 9-10. Scientists will use advanced brain imaging, interviews, and behavioral testing to determine how childhood experiences interact with each other and with a child’s changing biology to affect brain development and—ultimately—social, behavioral, academic, and health outcomes, including substance use and SUD. The ABCD study has enrolled 11,874 participants, meeting its recruitment target, and released data on the first roughly 4,500 participants to the scientific community in February 2018. Budget Policy: The FY 2020 President’s Budget request is $423.4 million, a decrease of $50.4 million, or 10.6 percent, compared with the FY 2019 Enacted level. Epidemiology, Services, and Prevention Research: NIDA’s Division of Epidemiology, Services, and Prevention Research (DESPR) supports integrated approaches to understanding and addressing the interactions between individuals and environments that contribute to drug use, addiction, and related health problems. The Division supports the annual Monitoring the Future survey, which tracks drug use and related attitudes among adolescent students nationwide, and the National Drug Early Warning System, a surveillance network that monitors emerging trends related to illicit drug use around the country so that rapid, informed, and effective public health responses can be developed and implemented when and where they are needed. DESPR also supports research on integrating prevention and treatment services into healthcare and community systems to reduce the burden of drug problems across the lifespan. For example, ongoing research is exploring SUD treatment in the justice system, including studies on implementation of medications to treat OUD and strategies for finding, screening, and, if necessary, testing people with SUD who are also at risk for HIV, as well as strategies for retaining them in treatment. NIDA also funds research into the efficacy of screening, brief intervention, and referral to treatment in primary care settings for reducing drug use and SUD. Other program efforts focus on research to optimize implementation of evidence-based prevention interventions and treatment services in real-world settings. For instance, NIDA is funding researchers to partner with states as they use the State Targeted Response funding provided to the Substance Abuse and Mental Health Services Administration (SAMHSA) in the 21st Century Cures Act to test approaches for expanding access to medications to treat OUD and naloxone for the reversal of overdose. NIDA partnered with the Appalachian Regional Commission, CDC, and SAMHSA to issue nine grants to help communities develop comprehensive approaches to prevent and treat consequences of opioid injection, including SUD, overdose, HIV, hepatitis B and C virus infections, as well as sexually transmitted infections. Funded in FY 2017, these projects will work with state and local communities to develop best practice responses that can be implemented by public health systems in the nation’s rural regions. Budget Policy: The FY 2020 President’s Budget request is $289.5 million, a decrease of $34.5 million, or 10.6 percent, compared with the FY 2019 Enacted level. More than nine million people pass through the justice system each year and the average daily population of U.S. jails and prisons is 2.5 million. Most people (70 percent) who encounter the justice system have used drugs; 25 percent have used heroin—roughly 100 times the community-level rate of use. While administering medications for opioid use disorder increases connections to care and reduces mortality and recidivism, fewer than 1 percent of U.S. jails and prisons offer them. Recent data suggest that implementing medications for OUD in jail and prison settings can dramatically decrease overdose deaths of justice-involved populations and even translate into substantial reduction in community-level mortality. As part of the NIH HEAL Initiative, NIH will establish a network of research investigators to rapidly conduct studies on quality care for opioid misuse and OUD in justice populations by facilitating partnerships between local and state justice systems and community-based treatment providers. Specifically, this work will include (1) conducting studies on the effectiveness and adoption of new medications, prevention and treatment interventions, and technologies in justice system settings; (2) conducting ongoing research on dynamic changes in policy and practice; (3) leveraging existing data sources and developing innovative research methods to address the opioid crisis; (4) fostering partnerships to ensure effective dissemination of lessons learned to the justice system and community-based provider stakeholders; and (5) conducting research on the most effective strategies for disseminating lessons learned to ensure scalable, sustainable solutions. Therapeutics and Medical Consequences: NIDA’s Division of Therapeutics and Medical Consequences (DTMC) supports preclinical and clinical research focused on developing therapeutics for the treatment of SUD. Since the pharmaceutical industry has traditionally made limited investment in this area, the responsibility for supporting the development of therapeutics has rested largely with NIDA. To most effectively leverage NIDA resources, DTMC encourages the formation of partnerships among pharmaceutical and biotechnology companies, academic institutions, and other stakeholders with the common goal of expeditiously advancing new and repurposed compounds through the medications development pipeline toward FDA approval. For example, in collaboration with US WorldMeds, DTMC supported clinical trials on LUCEMYRA™, the first medication targeted specifically to treat the physical symptoms associated with opioid withdrawal. Having been shown to be safe and effective at managing withdrawal in patients discontinuing opioid use under medical supervision, LUCEMYRA™ was approved by the FDA in May 2018. NIDA also supports research to reduce the medical risks of compounds and to make them more feasible for pharmaceutical companies to complete costly phase IIb and III clinical studies for SUD indications. Budget Policy: The FY 2020 President’s Budget request is $146.6 million, a decrease of $17.5 million, or 10.6 percent, compared with the FY 2019 Enacted level. National Drug Abuse Clinical Trials Network (CTN): The overarching mission of the CTN is to allow medical and specialty treatment providers, treatment researchers, patients, and NIDA to cooperatively develop, validate, refine, and deliver new treatment options to patients. The CTN comprises: 13 research nodes with 25 principal investigators affiliated with academic medical centers and large health care networks; two research coordinating centers; and more than 240 community-anchored treatment programs and/or medical settings in over 40 States plus the District of Columbia and Puerto Rico. This unique partnership enables the CTN to conduct studies of behavioral, pharmacological, and integrated treatment interventions in rigorous, multisite clinical trials to determine effectiveness across a broad range of settings and patient populations. It also allows the CTN to ensure the transfer of research results to physicians, clinicians, providers, and patients. The network evaluates interventions, implementation strategies, and health system approaches to addressing SUD and related disorders, such as co-occurring mental health disorders and HIV. The CTN is conducting studies to evaluate strategies for integrating OUD screening and treatment into emergency departments, pharmacies, primary care clinics, and American Indian communities. It has also supported studies to capture important data for research on SUD in electronic health record (EHR) systems in primary care and emergency departments. The CTN is currently developing and testing a clinical decision support tool that integrates with EHR systems to help doctors diagnose OUD and either provide treatment or refer patients to appropriate treatment. Additional studies are investigating the effectiveness and safety of a combination pharmacotherapy for treatment of methamphetamine use disorder, assessing the effectiveness of OUD treatments for HIV-positive individuals with OUD, and improving the ability of healthcare providers to detect and address cocaine use using smartwatch technology. The CTN is also developing studies to examine the effects of medications for OUD in pregnant women and the effects of medical cannabis use using EHR data. Budget Policy: The FY 2020 President’s Budget request is $37.2 million, a decrease of $4.4 million, or 10.6 percent, compared with the FY 2019 Enacted level. The opioid use crisis in the U.S. has been associated with a significant increase in the prevalence of pregnant opioid-dependent women and neonatal abstinence syndrome, which is associated with adverse health effects for the infant and costly hospitalizations. Maintenance with sublingual (SL) (under the tongue) buprenorphine (BUP) is efficacious for OUD but has disadvantages that may be heightened in pregnant women including the potential for poor medication adherence, treatment dropout, and negative maternal/fetal effects associated with the way the medication’s levels in the body ebb and flow between doses. Extended release (XR) formulations may address some of these disadvantages. The primary objective of the CTN MOMs trial is to evaluate the impact of treating OUD in pregnant women with BUP-XR, compared to sublingual BUP, on maternal and infant outcomes. The study will also test a conceptual model of the mechanisms by which BUP-XR may improve maternal-infant outcomes. As part of the NIH HEAL Initiative, NIDA will continue to expand its support for new research efforts to combat opioid addiction, with several major projects beginning or ramping up in FY 2019 with continued support into FY 2020. Initiatives under consideration include studies to determine the optimal length of medication treatment for OUD; management of subsyndromal and low-severity OUD; preventing OUD in older adolescents and young adults; and understanding consequences of prenatal opioid exposure on brain and behavioral development. Evaluating medications already in use internationally but not in the U.S. Developing devices to prevent and treat OUD and overdose. Opioid misuse and addiction is an ongoing and rapidly evolving public health crisis that affects millions of Americans and requires innovative scientific solutions. A great tragedy of the opioid crisis is that so many effective tools already exist but are not being deployed effectively in communities that need them. Only a fraction of people with opioid use disorder (OUD) receive any treatment, and of those, less than half receive the medications that are universally acknowledged to be the standard of care, or they receive treatment for too short a duration. In partnership with the Substance Abuse and Mental Health Services Administration, and as part of the broader NIH HEAL Initiative, NIDA is leading a multisite research effort called the HEALing Communities Study. This study will develop and test strategies to help communities respond rapidly and effectively to their opioid crisis with a focus on significantly reducing opioid-related overdose fatalities by 40 percent in 3 years and improving other outcomes. More specifically, the funding opportunities released in September 2018 (RFA-DA-19-0164 and its companion RFA-DA-19-0175) call for cooperative agreement applications for a data coordinating center and up to three research sites to measure the impact of integrating evidence-based prevention, treatment, and recovery interventions for opioid misuse, OUD, opioid-related overdose events and fatalities across multiple settings including healthcare, behavioral health, and justice. Each research site will be made up of several counties, towns, or cities within a single state, and will involve community resources such as police departments, faith-based organizations, and schools, with a focus on strong partnerships with state and local governments. The study also aims to decrease the incidence of OUD; increase the number of individuals receiving medications for OUD, staying in treatment beyond six months, and receiving recovery support services; and expand the distribution of naloxone. The lessons learned from this study will allow us to parlay the power of science to tackle one of the worst drug crises our country has ever seen. NIDA also plans to expand the size and scope of research conducted by the CTN to address emergent needs presented by the opioid crisis. The CTN has already generated important findings on the effectiveness and safety of medications to treat OUD and the utility of behavioral interventions for OUD management. By incorporating new research sites and investigators into existing research nodes and centers, the CTN will incorporate OUD-related research questions into studies currently underway, expedite new studies of OUD treatment in general medical and other settings, and enhance clinical and research training opportunities. While medication-assisted treatment (MAT) is known to be effective to OUD, there is significantly less evidence about how long individuals should remain in treatment, or what the minimum length of MAT should be, given that most patients do not want to take medication for longer than necessary. Starting with buprenorphine, the NIDA CTN will be studying the optimal length of treatment in order to better understand how best to deploy this highly effective, evidence-based intervention. NIDA is also in the planning stages of using the CTN to build the evidence base for early detection and intervention in individuals with opioid misuse who do not meet diagnostic criteria for severe OUD. While misuse of prescription opioids like Vicodin™ and OxyContin™ and use of heroin are at record low levels among middle and high school students, the prevalence of opioid misuse has risen dramatically among older adolescents and young adults. As part of its efforts to address the opioid crisis, NIDA will focus on preventing OUD during this vulnerable time of transition. The goal of this prevention initiative is to develop and disseminate evidence-based prevention interventions targeting adolescents and young adults ages 16-30 residing in areas that are affected by the opioid crisis. Studies will be conducted to improve our understanding of risk factors to opioid misuse, transition to OUD, and opioid overdose as well as other adverse health consequences. Research grants in this initiative will also support studies to test interventions in a variety of settings in the healthcare, community, and justice systems. Settings selected will encompass those most likely to reach the targeted audience including primary care centers, emergency departments, urgent care centers, HIV/STI clinics, school-based and community college health centers, the workplace, and the justice system. It is well established that the first few years of life are a period of exponential brain growth and development, however, there is much to be learned about typical brain development beginning prenatally through early childhood, its variability, and how it contributes to cognitive, behavioral social, and emotional function. Knowledge of normative brain trajectories is critical to understanding how brain development may be affected by exposure to opioids and other substances (e.g., alcohol, tobacco, cannabis), stressors, trauma and other significant environmental influences. This knowledge is critical to help predict and prevent some of the known impacts of pre-/postnatal exposure to certain drugs or adverse environments, including risk for substance use, mental disorders, and other behavioral and developmental problems. Currently, no large prospective cohort study has been conducted to comprehensively assess brain development or the long-term consequences of early adverse experiences or exposure to opioids, other drugs (including prescribed medication), or other substances (e.g., tobacco, alcohol, cannabis). Furthermore, establishing a causal link between substance exposures and specific outcomes is very difficult due to confounding factors such as socioeconomic, environmental, cultural, and genetic influences. To disentangle these factors, the HEALthy Brain and Cognitive Development study will establish a large cohort of pregnant women from regions of the country significantly affected by the opioid crisis and follow them and their offspring into early childhood, collecting data in the following domains: pregnancy/fetal development measures; infant and early childhood structural and functional brain imaging; medical history; family history; biospecimens; and social, emotional, and cognitive development. This prospective approach will allow for the investigation of pre-symptomatic changes in brain and behavioral development resulting from early exposure to opioids and other substances, as well as associated adverse conditions that might predict emergence of SUD and other mental illness. It will also identify protective and resiliency factors that may ameliorate the effects of these exposures and inform the development of early interventions. Budget Policy: The FY 2020 President’s Budget request is $250.0 million, which is flat compared with the FY 2019 Enacted level. This includes $3.0 million for Research Management and Support related to this area of research. Intramural Research Program (IRP): In addition to funding extramural scientists, NIDA also conducts research in high priority areas through its Intramural Research Program (IRP). Intramural research at NIDA focuses on conducting multidisciplinary cutting-edge research to: 1) elucidate the mechanisms underlying the development of addiction; 2) evaluate the potential of emerging new therapies for SUD, including pharmacological and non-pharmacological interventions (e.g., psychosocial, biofeedback, brain stimulation technologies); and 3) identify and pharmacologically characterize emerging designer drugs such as synthetic opioids, stimulants, and cannabinoids providing data-based evidence to the public on the dangers of these street drugs. For example, IRP investigators are testing a novel compound to treat OUD which targets a particular subset of opioid receptors. Investigators are testing whether the drug reduces self-administration of opioids and whether it reduces drug-seeking behaviors in a variety of animal models. Parallel studies with individuals addicted to prescription opioids are testing its effects on opioid craving. If trials prove successful, this compound could be a new medication for OUD. The IRP is also working in partnership with a pharmaceutical company that has recently licensed an NIH patent for a non-opioid compound which could be taken at the same time as an opioid pain reliever but could reduce the chance of becoming addicted. Preliminary animal studies have suggested that the compound reduces opioid self-administration and drug-seeking behavior, while preserving the pain-relieving effects of opioids. This compound holds promise as a potential adjunct to opioid treatment for pain, and could also be useful as a treatment for OUD. Budget Policy: The FY 2020 President’s Budget request is $86.6 million, a decrease of $9.6 million, or 10.0 percent, compared with the FY 2019 Enacted level. Research Management and Support (RMS): RMS activities provide administrative, budgetary, logistical, and scientific support in the review, award, and monitoring of research grants, training awards, and research and development contracts. Additionally, the functions of RMS encompass strategic planning, coordination, and evaluation of NIDA’s programs, regulatory compliance, international coordination, and liaison with other Federal agencies, Congress, and the public. RMS staff at NIDA are also helping to coordinate NIDA’s involvement in the NIH HEAL Initiative, spearheading NIH’s response to the opioid overdose epidemic. NIDA currently oversees more than 1,700 research grants and more than 80 research and development contracts. In addition to the infrastructure required to support research and training, NIDA strives to provide evidence-based resources and educational materials about substance use and addiction, including timely public health topics such as opioid overdose prevention, marijuana research, synthetic drug trends, and medication-assisted treatment for opioid use and addiction. The RMS portfolio also incorporates education and outreach activities to inform public health policy and practice by ensuring the Institute is the primary trusted source for scientific information on drug use and addiction. NIDA is committed to being at the forefront of training the next generation of innovative researchers by supporting both pre-doctoral and postdoctoral-level scientists interested in drug use and addiction research. NIDA leads the NIH Pain Consortium Centers of Excellence in Pain Education (CoEPEs). These twelve centers work to enhance patient outcomes by improving the education of healthcare professionals about pain and its treatment. The CoEPEs act as hubs for the development, evaluation, and distribution of pain management curriculum resources for medical, dental, nursing, and pharmacy schools to improve how health care professionals are taught about pain and its treatment. In addition, NIDA’s RMS portfolio includes the NIDAMED initiative6, which is aimed at engaging and educating clinicians in training and in practice in the latest science relating to drug use and addiction. For example, almost a year (11 months) after the NIDAMED CME/CE “Adolescent Substance Use and Rx Misuse Course”7 went live, 17,418 clinicians engaged with the CME/CE course, and 7,455 clinicians received a CME/CE certificate for taking the course. In addition, NIDAMED also facilitated a national partnership between the NIH and the American Dental Association on ways to enhance and support dentistry’s role in preventing opioid misuse, resulting in a joint article8 between NIDA and the National Institute of Dental and Craniofacial Research that was published in the July issue of the Journal of the American Dental Association. As part of NIDA’s continuing support of NIDAMED, a new initiative, “Science to Medicine,”9 has been launched to help engage the clinician community in integrating cutting-edge research into their practice. The first topic in the “Science to Medicine” series featured how six clinicians integrated Medication Treatment for Opioid Use Disorder10 into their practices. In conjunction with this series, NIDAMED also developed new resources in collaboration with emergency department specialists. The resources, “Initiating Buprenorphine Treatment in the Emergency Department,”11 reflect best practices for initiating buprenorphine in emergency departments and offer tools to assist emergency room clinicians. Budget Policy: The FY 2020 President’s Budget request is $66.0 million, a decrease of $7.0 million, or 9.6 percent, compared with the FY 2019 Enacted level. Excluding HEAL funding for RMS, the request is $63.0 million, a 10.0 percent decrease from the FY 2019 Enacted level of $70.0 million. Download the full 2020 Fiscal Year Budget (PDF, 923KB). 2017 National Survey on Drug Use and Health, 2018. SAMHSA. Rudd, R. et al. MMWR Morb. Mortal. Wkly. Rep. 65, 1445-1452, (2016).